Rent the entire Silverpick Lodge and sleep up to 48 of your nearest and dearest under one roof. The Lodge is a great place to hang with your friends and loved ones. There are 13 sleeping rooms, 20 beds, 4 pullout couches, 3 decks and 2 private fireplaces. There are 12 condos available on site for rental as well. You can host a group of 100 and make the lodge vacation central. The Lodge offers an intimate experience akin to that of private home or finer bed and breakfasts. Lodge rooms are appointed with furniture crafted by local artisans and all beds come equipped with down comforters, feather beds and down pillows. They are clean, cozy and very comfortable. The Lodge offers many amenities. There's the lobby with leather couches and massive fireplace; game room with free pool, foos ball, ping pong and shuffle board; spa with sauna, steam room, massage room and three hot tubs; library with over 5,000 books, free Wi Fi; free shuttle to the ski area: breakfast room to gather for coffee and bagels; and best of all there's the Columbine Room. The Columbine Room is a 1200 sf multi purpose room that comes equipped with a kitchen fully stocked with all the tables, chairs, pots, pans, silverware, plates, glasses and utensils you'll need for 80 people. There are 2 refrigerators, 2 stoves, 2 dishwashers, and a kegerator! And if you want to have a BBQ there are 2 grills for use outside on the patio. When you Rent the Lodge, you get exclusive use of the Columbine Room to do with as you please. Some folks have dances, some folks have prayer meetings, some have had formal dinners and some have used it as a romper room. It's all up to you. You can bring your own food and prepare your own meals or else the Sow's Ear can cater a BBQ or buffet. We've made three miles of walking trails through the forest surrounding the Lodge and hundreds more are available throughout the neighborhood. Finally, upstairs is the the Sow's Ear offering the best steaks on the mountain for over 20 years. We will happy to assist you with event planning for your group and direct you to area attractions and special events. PLEASE CALL FOR PRICING FOR EXTENDED STAYS. Columbine Room with 2 Refrigerators, 2 Ovens, 2 Dishwashers, 5 Burner Cook Top. ALCOHOL: Is legal for persons over the age of 21 in Colorado. You may purchase alcohol elsewhere and drink it anywhere in the Lodge except for the restaurant. You must purchase alcohol in the restaurant to consume it there. ARBOR (PERGOLA): The Pergola is 8 feet wide, 7 feet tall and 3.5 feet deep. You may decorate it however you want. BAGELS AND COFFEE: Are provided in the Break Room. There is no need to add water to the coffee machine in the Break Room. Just fill the filter with an appropriate amount of grounds and press the start button. BUSINESS SERVICES: A copy machine is available @ $.10 a copy. Just ask at the Front Desk if you would like to print a boarding pass or other document. There is high-speed wireless Internet throughout the lodge. CLEANING SUPPLIES: Are provided for the Columbine Room and Break Room. If you can't find what you need just ask at the front desk. CEREMONY SITE: The lawn under the aspens in our park is available for wedding ceremonies and receptions at no charge. For 2019 we have secured an option to hold your ceremony in our neighbors meadow south of the Lodge. There is a $500 fee to use the meadow. There are also several other sites nearby in the national forest available for a nominal fee. CHAIRS: We have 120 folding white wedding chairs that are available for use for your wedding ceremony. The wooden folding chairs from the columbine Room may not be used outside. Chair use is free onsite. There is a $5 per chair use fee off site. CHARCOAL GRILLS: We've got 2 of 'em, 2 feet by 5 feet long. Buy Match Light charcoal or be prepared to wait forever for it to light at altitude. CHECK IN AND CHECK OUT: Check in is is officially between 4:00 pm and 6:00 pm. However, if no one has rented the Lodge the precious night, you may check in at noon. Official Check Out is at 10 am. However, is no one is checking in the day you leave you may stay till noon. We will do everything possible to allow access to the Columbine Room at the earliest possible opportunity on the day of check in. CHIPMUNKS: We like to keep the lobby doors open. Chipmunks like to come inside. You may chase them back out if you wish. CLEANING FEE: We clean all sleeping rooms but please leave the public areas as you find them. Leave it like you found it and there is no cleaning fee when you Rent the Lodge. Dishes must be washed and floors swept in the Columbine Room. We offer an optional cleaning service for $1000 if you wish to party and run. 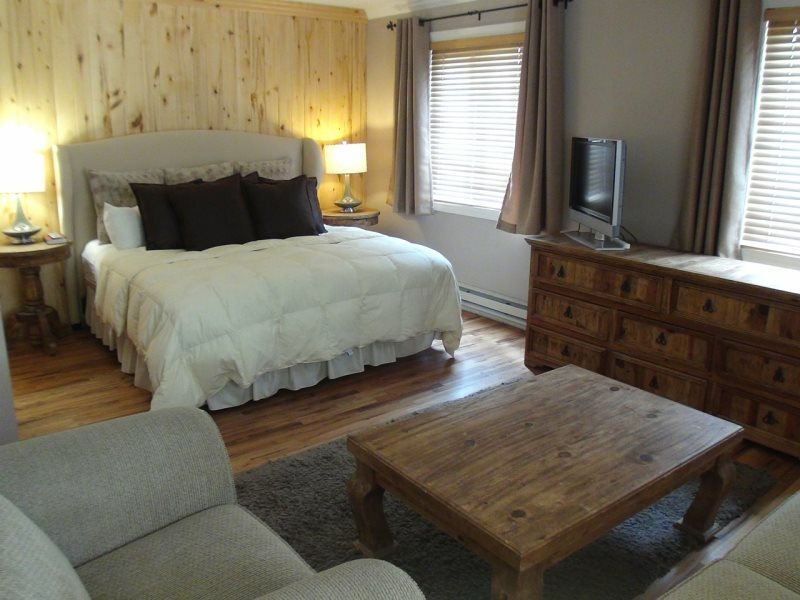 CONDO RENTAL: When you Rent the Lodge, you and your guests may rent condos for 10% off. If they rent it online, which is the easiest and more preferable, the discount will be applied at check in. COLUMBINE ROOM: See a list of pots, pans, tables chairs, etc. below. CRIBS: We have Pac 'n Plays available. Please call to reserve one. DAMAGES: The Lodge is inspected prior to use by the housekeeping staff. Please report any damages you note upon arrival. Any damages reported by housekeeping will be repaired and charged to your credit card in the amount of the damage repair or item replacement plus labor plus the cost of time spent administrating the repair or replacement rounded up to the nearest $100. Deposit: 50% of full payment & tax is due at the time of booking. Ask if you want to make other arrangements. Full Payment: Due at check in. Any amount your guests pay at check in will be deducted from the total amount due. Cancelations: Your deposit will be forfeited if you cancel at any time. If we are able to rent the canceled dates we will refund whatever portion of the deposit we are able to collect from the new rental. EXTRA NIGHTS: When you Rent the Lodge you may rent up to 3 rooms the prior or proceeding night at a discounted rate. Call for details. FACEBOOK: We have several photo albums on Facebook that will give you a much better idea what the Lodge, restaurant and ceremony sites are like. Reach our page through the link at the top of this page. FIRE ALARM: If the Fire Alarm sounds in your room do not attempt to turn it off! We will turn off the alarm and call to check on you. If the smoke is due to cooking or the fireplace, open the doors and windows to aid in smoke dispersal. FIRE PIT: We provide firewood. You provide common sense. Be safe and have a good time! FIREWOOD: For the lobby and break room are stored on the porch south of the entrance. You may build a fire anytime you want. Be sure the flu is open (pulled towards you) before lighting fires. FIRE LANES: Please park in designated parking places only. Do not park alongside roads or immediately in front of the Lodge. These are designated fire lanes and you will be towed. FRONT DESK: Is open randomly throughout the day but someone will be there daily between 4 pm and 6pm or until all the guests have checked in, whichever comes first. You can contact me from 8 am till 6pm at 800-295-4820. You may call me on the same number after hours if you have an emergency and need help. GAME ROOM: Free pool, ping pong, shuffle board and foos ball tables are located on the first floor of the Lodge. GUEST LIST: When you Rent the Lodge we will send you a spreadsheet that lists all the rooms and the number of available sleepers in each. Please fill it out and email it back to the Lodge as soon as you determine which rooms your guests will be staying in. This helps eliminate confusion between guests who are staying in the Lodge and those staying in condos. HOT TUB: Please shower before using the hot tubs. Hours are 24/7 with a couple hour shut down for cleaning. Do not bring glass into the Hot Tub Area. Please shower before using the hot tubs. HOUSEKEEPING: Please ask if you'd like your trash removed or towels refreshed. You may help yourself to the extra towels, soaps, tissue and toilet paper in the cabinet by the front desk at anytime. There are also towels in the spa. ICE MACHINE: Is located in the basement of the Lodge. If you need lots of ice to fill a cooler ask up in the restaurant and they will help you out. INTERNET: The wireless internet is open for all guests free of charge. IRON AND IRONING BOARD: Are located in each room and in the laundry. KEYS: When you arrive there will be a key in the doorknob of each Lodge room. Guests may pick up one additional key if they can catch someone at the Front Desk. The group leader will be given the Keys to the Kingdom which open all the guest room doors so you can let your guests back into their rooms when they lock themselves out. Please don’t lose your keys. If you do lose your keys you will be charged $50.00 per key. Please don't loose your keys. LIBRARY: You may borrow any of the books in the Lodge bookcases to read during your stay. If you haven’t finished before you leave and want to take one with you that’s ok too. LIGHTS: Please turn off the lights in the public areas (lobby, break room. bathrooms, spa, game room and Columbine Room) when you go to bed just as you would at home. MASSAGE THERAPY: Stop by or call the Front Desk to make an appointment. MOVIE SCREEN: We have a large screen and a projector. Ask about them at the Front Desk. MARIJUANA: Is legal in Colorado but all smoking is prohibited in the Lodge rooms. Please toke outside! MAXIMUM OCCUPANCY of the COLUMBINE ROOM is 95 for tables and chairs and 202 for chairs only. MAXIMUM OCCUPANCY of the SOWS EAR is 144 for tables and chairs. OUTSIDERS: When you Rent the Lodge, you have exclusive use of the lodge rooms, spa, game room and Columbine Room. The Sow's Ear is to the public for dinner unless you rent it yourself. There will also be people from the condos coming in to register at the front desk. Occasionally someone will come over from the condos to the break room for coffee in the morning as we are generous with our coffee. Sometimes children from the condos will see children staying in the lodge and want to play with them or a child may wander down from the restaurant to the game room. Feel free to kick them out! Most of the time you will see no one who is not a member of your party. PETS ARE ALLOWED WITH APPROVAL: Please call us to talk about bringing your pet! Who doesn't love dogs? All dogs with doggie beds will be approved. Please bring a doggie bed with you. PICNIC AREA: There are picnic tables, grills and a swing set, located in the park behind the woodshed, south of the Lodge parking lot. You can use the park as you like for picnics and games, etc. The park closes at 9 pm so all music must cease, the park must be cleaned and all guest must be out by 9 pm. PILLOWS: If you prefer foam pillows please ask for them at the front desk. PLAYGROUND: There is a swing set, slide and sand box in the park. QUIET TIME:. What!!! You rented the lodge, party till dawn. However, you must not keep the neighbors in the condos awake. So late night parties, after 9pm, must be held indoors, or outside on the Columbine Patio. RAINY DAY SNOWY DAY WEDDINGS: All hail the fertility god! The Lobby and Columbine Room are available as backup spaces should you need to move your ceremony indoors at the last minute. SITE FEE: There are no site fee for wedding ceremonies held in the Park at the Lodge, the Lobby or the Columbine Room. There is a $500 site fee to hold an event in our neighbors meadow just south of the Lodge. Sometimes there are horses pastured in the meadow who may mingle with your guests. We will set up chairs in the meadow at no charge. SKI SHUTTLE: We will leave in front of the Lodge whenever you are ready between 8am and 5pm. Just come up to the desk and ask for a lift. Call us at 970-259-6600 for a pick up at the ski area. The shuttle is also available for a fee for airport pick ups and special trips. SNOW SHOES & SLEDS: You may borrow shoes and sleds from the front desk. Please return them at the end of the day. You will be charged $50.00 for sleds and $200 for snowshoes not returned by 6pm. SOW’S EAR: The restaurant is open to the public during the high seasons from 4 until 9pm five days a week from Wednesday thru Sunday. Happy Hour is 4 to 6pm. Dinner is served from 5 to 9 pm. Quiet time is 10 pm and the music is turned off at that time unless you've rented the restaurant as well, in which case, party on Garth! TELEPHONE: Bring your cell phones, there are no telephones in the lodge rooms. TRASH: Is removed from the public areas including the Columbine Room by the housekeeping staff daily. WEDDING ASSISTANT: Let us help you out! The Silverpick Lodge offers you the opportunity to engage a personal on site wedding assistant to help you take your celebration to the next level. He’ll be here to do all the things you don’t have time to do yourself. He will answer your questions, direct you where you need to go, find what you need and do what you ask. He’s a “Man with a Van” and will pick up or drop off folks at the airport, run errands to town or take a group of your guests on a Tour of the mountains or brew pubs. He’ll greet your Vendors, direct them to where they need to go and to help them set up. He’ll help set up and clean up parties in the Columbine Room, on the Patio or in the Park. He’ll help you resolve unforeseen issues that might arise. He’ll point you to local resources to get what you want. He’ll fetch ice and other necessities. He’ll light the grills and set up the fire pit. He’ll bartend or set up and serve a buffet. He will help you with anything he can while you are on site at the Silverpick Lodge. Your Personal Wedding Assistant will make an initial contact with you by phone to discuss the scope of services. He’ll be here to great you when you arrive so you can discuss the details then or whenever convenient for you. Extra time is billed at at $60 per hour.